We don't have pictures of our boat yet, but this is a similar one. 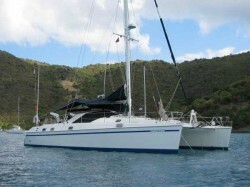 Our boat is a 48" catamaran named "Perry" (short for peregrine falcon, which is our favorite bird). The dinghy will be called "Grin." Stay tuned for pictures of the actual boat. We will be in Florida for a few weeks to get the boat ready. Then we plan to sail to the Bahamas for the winter. No snow (Mark was really looking forward to sledding) but lots of sand and water.